The following are detailed specifications about the Grey Glass Knot. This fun hand made glass knot can stand alone, in multiples or repeat around other decorative elements. Endlessly twining and flawless, the glass knot engages the eye and enchants the mind. 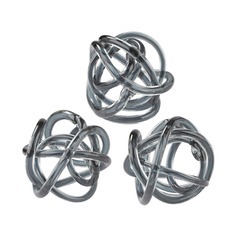 This Grey Glass Knot is part of the $item.xCollectionName Collection from Dimond Lighting. The following items are also part of the $item.xCollectionName Collection.